Being one of the top producing brands of sewing machines over the years, Juki has produced and distributed high-quality sewing machines all over the world. However, the question begs, which is the best Juki sewing machine? In this article, we will dive deep into what makes Juki sewing machines the best and also identifying what specific model is eyed to be the best for all types of sewing projects. We will also discuss our picks on which Juki sewing machine is best for home use and our choice for the best Juki heavy-duty sewing machine for industrial use. It is a fact that there are a huge number of sewing machines in the market at present. Juki is known to be one of the most trusted brands when it comes to sewing machine production. For the overall best pick, we recommend the Juki HZL F600. This remarkable piece of equipment weighs 21 pounds which can be considered light for a heavy-duty machine. Be that as it may, it can still handle thick fabric as well as multiple layers of fabric. This machine can breeze through a sewing project with 900 stitches per minute (spm). Additionally, it also comes with an 8” x 12 ¼” extended workspace which is perfect for quilting projects. It also has excellent features such as 625 built-in stitches, 255 patterns, 15 types of presser foot, and 16 one-step buttonhole styles to name a few. One notable feature, however, is its “Box Feed Technology” that has the feed dog moving in a box motion to eliminate shrinking and shifting of the material. This machine carries a remarkable 625 built-in stitches and 255 patterns. This allows you to choose any type of stitching you desire for a sewing project with ease. All of these can be selected through a push-button stitch selection function. In addition, you can also easily adjust the stitch width at a maximum size of 7 mm, while the stitch length can be adjusted up to 5mm. This allows determining the perfect stitch size for a specific project you are working on. Another feature that makes this machine stand out is that it carries 16 different buttonhole styles. Using this feature allows you to create buttonhole styles suitable for the fabric you are working on. It has options for both keyholes and boxed buttonholes. In addition to that, this machine also allows you to make adjustments to the buttonhole’s width without decreasing or increasing the size of the stitching. When it comes to its presser foot, it is equipped with an impressive range of different presser foot types. This machine offers 15 different types of presser foot to cater to a wide range of stitching variations you can think of. Moreover, each of the presser foot can be easily attached and taken off once you are done using it. The presser foot types include the zigzag foot, blind hem foot, overcasting foot, auto buttonhole foot, edge sewing foot, quilting free motion foot, and patchwork foot to name a few. As mentioned, one of the notable features of this machine is its “Box Feed Technology”. In general, the motion in which the feed dog operates is in an oval motion. This is the conventional oval feed system that can be found in most sewing machines. Whereas with this machine, it introduces a new system in which the feed dog operates in a box motion. As a result of this innovative feature, it helps get rid of any shifting or shrinking in the material. It also makes the feed of the fabric smoother. 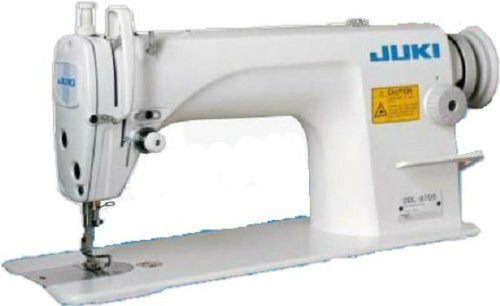 As for the best Juki sewing machine that we can recommend to be the best for home use, we picked the Juki TL 2000Qi Sewing and Quilting Machine. Juki clearly made a point not only to produce sewing machines that can be used commercially, but they also made ones for home use. However, it may be made for home use, but it does mean that it can’t stand long hours of operation and heavy duty sewing. This machine is durable and reliable to cater to a variety of projects you need to do at home. It has a very simple but elegant design and is made for heavy metal. This machine is equipped with a straight stitching feature and has a maximum speed of 1500 stitches per minute. With that said, it may not be the machine you need if you are doing the fancy and decorative stitching. Be that as it may, it offers an extended workspace which is perfect for quilting projects. It also comes with great features such as an automatic needle threading, 3 presser foot types, and LED light that gives sufficient lighting while you are working. This specific feature makes it easy when turning corners. With an automatic needle up/down feature, you don’t have to raise or lower the needle manually. All these are done automatically and with ease. The auto needle threading features save you the time and effort in manually threading your needle. This feature works best for people with eyesight issues or simply the ones who just want to get the process done immediately. Another notable offer this machine has is that it is equipped with a lighting feature. It has white LED lights to makes sure your workspace is properly illuminated. With this feature, you can easily work on your sewing projects and avoid mistakes and mishaps. This machine has another feature that saves you time and effort. The automatic thread cutter allows you to cut the thread once you are done and is easily controlled by a foot-pedal. All you need to do is the shift the foot pedal backward, and that’s it! 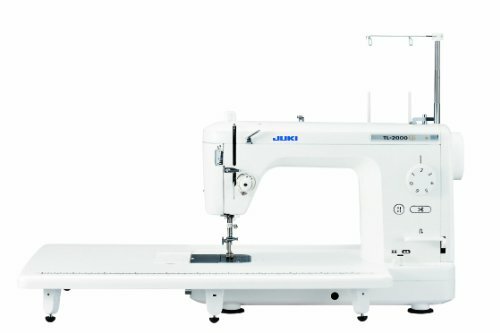 A definite powerhouse when it comes to sewing, the Juki DDL 8700 is our pick as the best Juki heavy duty sewing machine. If you are looking for a machine that can handle an industrial level of sewing workload, then this machine is the top choice. This machine is truly a heavyweight at its very essence. It is designed to have a solid and strong body and is powered by a servo motor. Known for its ability to control a machine’s sewing speed effectively, a servo motor consumes lesser energy. In addition to that, having a powerful servo motor allows this machine to have a jaw-dropping sewing speed of 5500 spm. This makes it one of the fastest machines in the market, plus it produces excellent quality stitches. Despite the heavy duty motor and super-fast sewing speed, this machine operates at a very low hum. Moreover, maintaining this machine is very easy since it has automatic lubrication to ensure all its parts are well-greased to function well. This machine remarkably attained a feat by having a maximum sewing speed of 5500 spm. This means that you can breeze through a large workload of sewing projects in a short period of time. This functionality is very important especially for small sewing businesses or even medium to large scale industries. Every minute is important when it comes to these types of businesses and having a high-speed machine can do wonders. Another feature that is hard to overlook is that this machine is powered by a servo motor. Some sewing machines operate with a clutch motor. A servo motor allows the machine to have more control over its sewing speed. This is the same reason why the Juki DDL 8700 can create 5500 stitches per minute at a maximum level. Furthermore, having a heavy-duty motor allows the machine to handle large amounts of workload. It also has an automatic lubrication feature. For a heavy-duty machine, making sure it is well maintained is utmost importance. The machine serves as a lifeline of the business and having machines that are not performing well can be a big problem. However, since this specific machine has automatic lubrication, you do not have to worry so much regarding its maintenance. With this feature, the machine’s parts are regularly greased to ensure that they function without any glitches. Why Choose a Juki Sewing Machine? Founded in 1938, Juki is a brand which originates from Japan that operates to manufacture industrial, and just recently domestic sewing machines. Known as one of the leading manufacturers of industrial machines, Juki is ranked as the number 1 manufacturer of sewing machines in the world. Over the years of manufacturing sewing machines, Juki ensures that they deliver the best quality of products to their customers. As part of the company’s code of conduct, Juki aims to create and supply services and products that are useful for society. Juki also makes it a point to do all these with careful consideration of safety and with the trust and satisfaction of its clients in mind. This is also the reason why Juki constantly offers innovative and revolutionary products. Currently headquartered in Tama-shi, Tokyo in Japan, Juki has established manufacturing satellites in Vietnam and China. At present, Juki products are sold in over 150 countries around the world. Juki vs Singer vs Brother Sewing Machines: Which Brand is Best? Ranked as the no. 1 manufacturer for sewing machines in the world, it is not questionable why Juki is dubbed as the best. With its long years of experience in producing high-quality industrial sewing machines, Juki has mastered this craft excellently. As a result, they have continued to create top performing products and also ventured into producing domestic sewing machines that are also gaining positive reviews from their clients. In line with the Juki is said to offer a wider range of sewing machines. Juki has categorized its products into two which are the machines for non-apparels and machines for apparels. For non-apparels, they have Cylinder-Bed Sewing Machine, Flat-Bed Sewing Machine, and Long Arm Sewing Machine to name a few. On the other hand, the sewing machine for apparels includes Zigzag Stitching Machine, Shape tacking Machine, Overlock/ Safety Stitch Machine, Computer Controlled Cycle Machine, 1-needle Lock Stitch Machine, and Bar Tacking Machine among others. Juki has proved that they have constantly created products and services that consumers want and need. For that reason, they have firmly placed their name at the top as the best brand as a sewing machine manufacturer and distributor. Headquartered in Tennessee, New York, Singer was established back in 1851. Surprisingly, it is the only sewing machine manufacturing company to break into a market that is mainly dominated by companies from Asia. As the only American company to join the top ranks in the sewing machine manufacturing industry, Singer has been producing and selling sewing machines ever since the 1800s. This only goes to show that Singer deserves the title of being one of the best. Although they offer a variety of sewing machines, Singer also takes special consideration to those who are entry-level sewers or beginners. However, there is without a doubt that they make machines that are durable and highly efficient. Some of the sewing machines they produce are Embroidery Sewing Machines, Portable Sewing Machines, Handheld Sewing Machines, Quilting Sewing Machines, Electronic Sewing Machines, and the Sewing Machines for Children. Brother is another Japanese mega company that keeps a headquarters in Nagoya, Japan. It is mainly an electrical equipment company that produces a wide range of products which includes, fax machines, printers, desktop computers, typewriters, and industrial sewing machines. It was founded in 1908, has made a name and rose to be a top-ranked manufacturer of sewing machines. They have several factories, one of which is located in Vietnam and is known to be the world’s largest single-brand factory. Back in 1908 when the company was founded, they did not immediately manufacture sewing machines, instead provided parts and repair services for sewing machines. It was known then as Yasui Sewing and Co. The name was later changed to Yasui Brothers’ Sewing Machine Co, and in 1928, they produced a chain stitch sewing machine which is used to make straw hats. The machine became an instant hit, and the company started mass production in 1932. The variety of machines they offer include Industrial Single Needle Sewing Machines, Domestic OverLockers, Home Sewing Machines, A-Grade Sewing Machines, and the Quilting Sewing Machines to name some. In summary, for years of experience in industrial sewing machine manufacturing, Juki has successfully earned the title of being the number 1 sewing machine manufacturer in the world. This company undoubtedly dominated the sewing industry with by mastering its craft. Pouring in years of dedication and passion for creating innovative and revolutionary products, it is no wonder that they have achieved such a great feat. Although Singer and Brother are considered its biggest competitors, Juki secured its stop on the top. 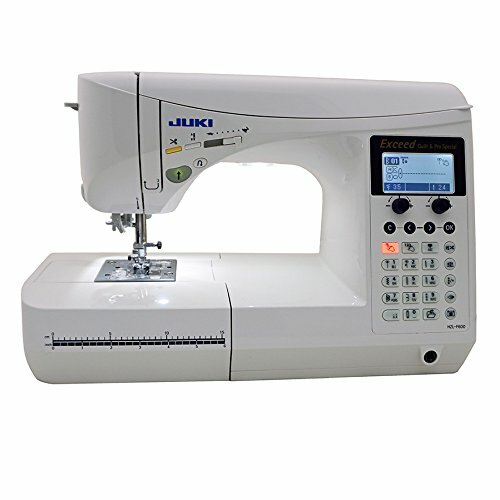 Among the remarkable products that Juki has created, we picked the Juki HZL F600 as the overall best sewing machine. Offering highly notable features that can cater to a wide range of sewing needs, this machine has it all. Additionally, we also recommended the Juki TL 2000Qi to be the ideal sewing machine for home use. Meanwhile, the Juki DDL 8700 is the one that best suits heavy duty and industrial use. Overall, no matter what category it may be, Juki does not disappoint to deliver the best machine to suit your needs.